Take HIGHWAY 5 south all the way to the INTERNATIONAL BORDER. When you cross the border you want to be in the FIRST LANE FROM THE RIGHT. All of the lanes will split off from one another and go in different directions. The lane you are in will have a SIGN, that says “ENSENADA ROSARITO SCENIC ROAD” you want to make sure that you follow this sign. 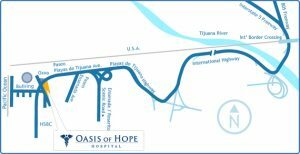 Making a right turn towards the scenic road to PLAYAS DE TIJUANA. You are now headed WEST alongside the border fence. You will drive for a couple of miles making your way up to the top of a big hill. At the top of the hill the road will curve to the left and head downhill. Towards the bottom of the road will split to the RIGHT, again, the SIGN will say ROSARITO, ENSENADA AND PLAYAS. Take this split to the right and follow it until you come to the exit PLAYAS DE TIJUANA. From the split to the exit is about 1 mile. Take the exit straight down into PLAYAS and go to the SECOND STOP LIGHT. The HOSPITAL will be on your LEFT and the BULLRING by the sea will be on your right. The hospital is a FOUR STORY, PEACH STUCCO AND GLASS BUILDING.